The ETA Vital Press is recommended for those who live healthily and want to give their bodies just the best. Ideal for preparation of RAW food. Excellent extraction of juice from fruits, vegetables and fresh herbs which guarantees full and refreshing tastes that you can enjoy e.g. during your breakfast. With a good dose of vitamins you crank up your body and give it a lot of energy. The juicer is made from a highly resistant and high-quality material which is harmless and easy to operate and maintain. It has two filling openings which makes processing faster and ensures that when using more ingredients, the tastes are mixed evenly. Juice extraction is slow but thorough. The fruit and vegetable juice thus maintains maximum vitamins, nutrients that are important for your body and, above all, its taste. 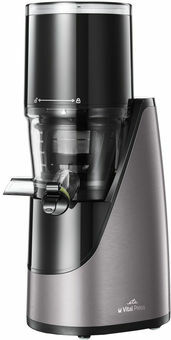 The appliance has a touch control panel with operation signal lights indicating the current function of the juicer. It features a STOP function for an immediate interruption of juice extraction and a REVERS function for the motor running in reverse direction if the amount of ingredients in the extraction area is excessive.